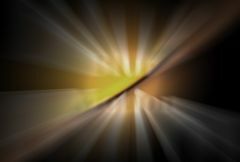 Performs a motion blur of the source clip between the specified From and To transformations. This can be used to perform radial zoom blurs, rotate blurs, directional blurs, or any combination of these. The From and To parameters do not refer to time. They describe the two transformations in space that determine the style of blur applied to each frame. Matte: Defaults to None. If provided, the amount of motion blur is scaled by this input for each destination pixel. This input can be affected using the Blur Matte, Invert Matte, or Matte Use parameters. Mode: Popup menu, Default: Blur Color . To Z Dist: Default: 0.8, Range: 0.001 or greater. Blur Res: Popup menu, Default: Full . Selects the resolution factor for the motion blur. This is similar to the general 'Res' factor parameter, but does a better job of averaging down to lower resolution and interpolating back up to the result. Higher resolutions give better quality, lower resolutions give faster processing. Half: The motion blurring is performed at half resolution. Quarter: The motion blurring is performed at quarter resolution. If enabled, uses a better quality but slightly slower method for performing the blur.